, a learned English bishop, was a Lancashire man by birth, and educated in St. John’s college, Cambridge. He was one of the first fellows of Trinity college after its foundation by Henry VIII. in 1546, and shortly after became master of it; and in 1554 was made dean of Norwich. In the reign of Edward VI. 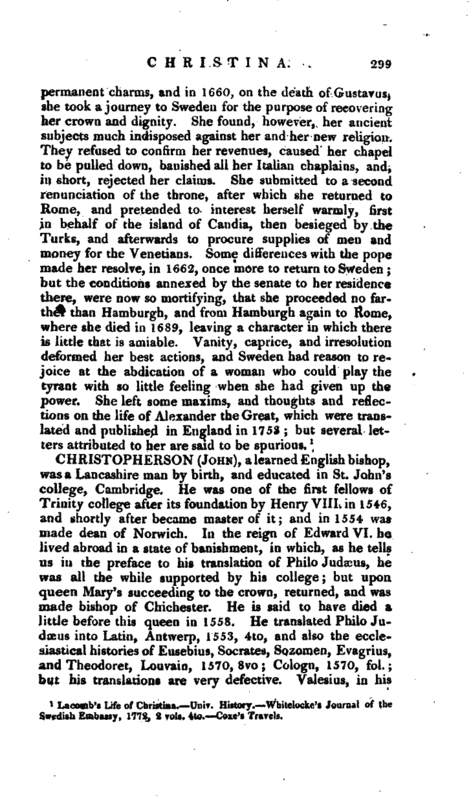 he lived abroad in a state of banishment, in which, as he tells us in the preface to his translation of Philo Judxus, he was all the while supported by his college; but upon queen Mary’s succeeding to the crown, returned, and was made bishop of Chichester. He is said to have died a little before this queen in 1558. He translated Philo Judaeiis into Latin, Antwerp, 1553, 4to, and also the ecclesiastical histories of Eusebius, Socrates, Sozomen, Evagrius, and Theodoret, Louvain, 1570, 8vo; Cologn, 1570, fol. hut his translations are very defective. Valesius, in his | preface to Eusebius, says, that compared with Rufinus and Musculus, who had translated these historians before him, he may be reckoned a diligent and learned man; but yet that he is very far from deserving the character of a good translator: that his style is impure, and full of barbarism; that his periods are long and perplexed: that he has frequently acted the commentator, rather than the translator; that he has enlarged and retrenched at pleasure; that he has transposed the sense oftimes, and has not always preserved the distinction even of chapters. 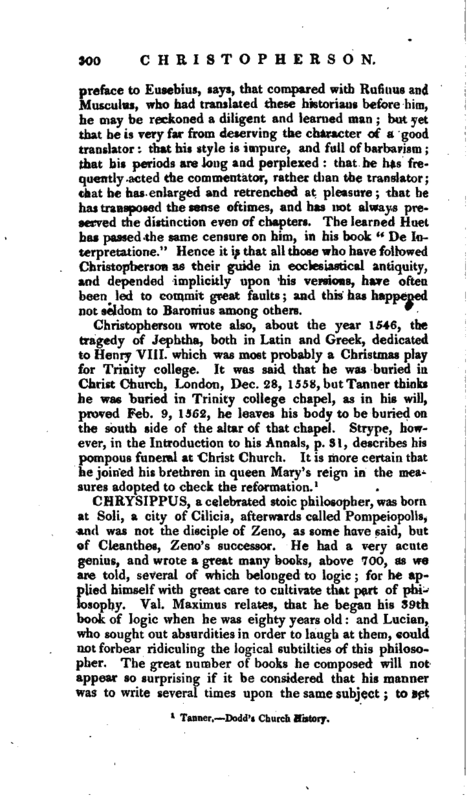 The learned Huet has passed the same censure on him, in his book “De Interpretatione.” Hence it is that all those who have followed Christopherson as their guide in ecclesiastical antiquity, and depended implicitly upon his versions, have often been led to commit great faults; and this has happened not seldom to Baronius among others. 1 Tanner. Dodd’g Church History.